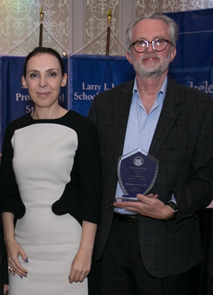 Photo Caption: Professor Shkelzen Badivuku, Medical Assistant, Berkeley College School of Health Studies (at right), receives the Commitment to Students Award during the 2018 Berkeley College Faculty Recognition Awards dinner, held on November 14, 2018, at The Terrace in Paramus, NJ. He is pictured with Eva Skuka, MD, Dean, Berkeley College School of Health Studies. “I feel privileged to have an opportunity to support, stimulate and empower my students to acquire knowledge and skills, and reach their full potential,” said Mr. Badivuku. “I feel I have done my job when I see my students apply the skills they acquired with confidence and enjoyment.” Mr. Badivuku is a resident of Fort Lee, NJ. Below (L to R) are: Michael J. Smith, President, Berkeley College; Rita Genao, MD, Medical Assistant, Berkeley College School of Health Studies; Beth Castiglia, PhD, Provost, Berkeley College; Eva Skuka, MD, Dean, Berkeley College School of Health Studies; Shkelzen Badivuku; and Kevin Luing, Berkeley College Board Chairman.